Fed Chair Janet Yellen said her expectation for the first increase in the Federal Funds Rate would come approximately six months following the end of the asset purchase program. Based on this statement, as you may recall from one of our previous posts, we have created the following potential timeline. Should the asset purchase tapering process continue on a pace of a $10 Billion monthly reduction following each of the Fed’s eight scheduled meetings this year, this would then conclude the tapering process towards the end of 2014. As a point of reference, the Fed was purchasing $85 Billion of bonds each month at the end of 2013 and reduced the pace by $10 Billion to $75 Billion per month in January 2014. The Fed further reduced its bond purchases by $10 Billion to $65 Billion per month in February 2014 and finally just announced another $10 Billion reduction to $55 Billion per month beginning in April 2014. Should the tapering process be completed by the end of 2014, and we tack on the six month window as suggested by Yellen, the first potential increase in the Federal Funds Rate would then take place during the spring time of 2015. If a Federal Funds Rate increase were to occur in the spring of 2015, this would represent the first rate increase in over eight years as the last increase in rates occurred in June of 2006. Based on this information, many have been wondering what will likely happen in the markets from now until that point in time when the Fed does start to tighten. While past performance is not an indication of future results and historical information should not be relied upon solely when making investment decisions, we felt that observing market behavior during previous periods of tightening might prove insightful. The chart below, which was compiled by Guggenheim Investments, provides the price performance of various asset classes for the 12 months preceding the commencement of interest rate increases, specifically during the years of 1983, 1986, 1994, 1999 and 2004. Source: Credit Suisse, Barclays, Bloomberg, Guggenheim Investments. Data as of 3/31/2014. *Note: Average price performance in the 12 months prior to Fed tightening cycles in 1983, 1986, 1994, 1999, and 2004. Past performance is not an indication of future results. According to S&P Dow Jones Indices, the S&P 500 index is widely regarded as the best single gauge of large cap U.S. equities. There is over U.S.D 5.14 trillion benchmarked to the index, with index assets comprising approximately U.S.D 1.6 trillion of this total. The index includes 500 leading companies and captures approximately 80% coverage of available market capitalization. You cannot invest directly in an index. Interestingly, the chart shows that U.S. equities, as measured by the price performance of the S&P 500 index, have performed well, in isolation and relative to various fixed income products – which also each registered positive average annual price returns during these periods. 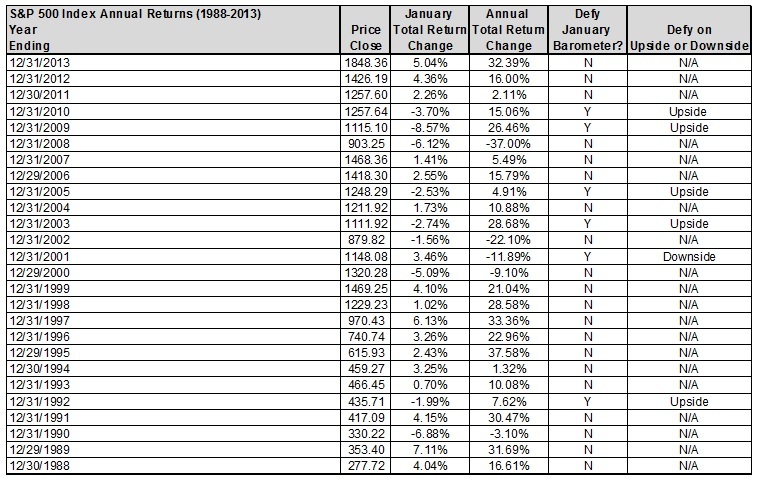 On average, the S&P 500 index had an average price gain of 22% over the years included in this Guggenheim study. We believe that the positive performance of equities during these periods is likely due to improving economic conditions (which would stand to help equities in general) that would put the Fed in a position to feel comfortable starting to raise interest rates. In providing this information, we are not advocating that investors should thus concentrate their portfolios in U.S. equities purely based on the results of this study. To the contrary, we contend that asset allocation remains of the upmost importance and should always be constructed in accordance with one’s investment objectives, investment timeframe and tolerance for risk. While past performance cannot guarantee future results and asset allocation cannot ensure a profit or protect against a loss, applying a historical perspective and maintaining an appropriate strategic asset allocation can help provide comfort and direction to investors during various market cycles. This post is provided for informational purposes only and should not be considered a solicitation to purchase or sell any particular security, strategy or investment product.